Another rainy day although I managed to get the waterbird count done without getting wet. The numbers of Northern Shoveler, Teal, Mallard, Little Grebe and Coot were much lower with just over three hundred Shoveler and less than a hundred each of the others. There were no gulls on the Sewage Pools but there was a male Garganey, a male Northern Pintail, two Ferruginous Duck and a single Black-necked Grebe in breeding plumage. Eight Spur-winged Lapwing were around the edge and two were mating. The best birds at the Sewage Works though were not on the water – a male Subalpine Warbler and a Common Whitethroat were in the bushes in front of the hide together with some singing male Spectacled Warbler and several Red-throated Pipit flying around. After a tip off from another birder I checked the Desalination fields for four Whimbrel he had seen there. I located them along the coast near the airport perimeter fence but they flew off eastwards as a patrol car drove close to them. A female Northern Wheatear was looking very bedraggled and several Kentish Plover were on the beach. 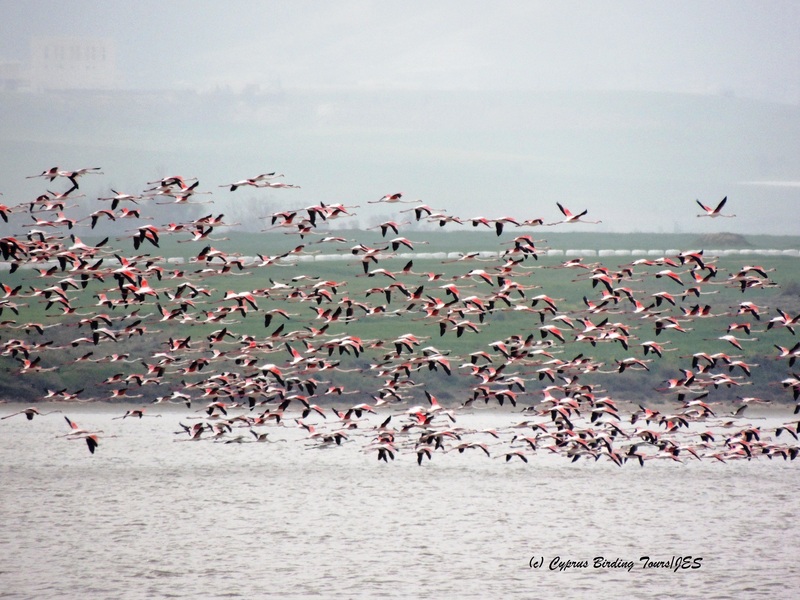 A surprise awaited me on the main Salt Lake – there were just under a thousand Greater Flamingo present – in February I had found just 69. There are still around 200 Common Shelduck present and over seven hundred Common Black-headed Gull were on the water. Also on the water were over 250 Slender-billed Gull – nearly all adults with a pinkish tinge and looking very smart. On the east side of the lake there was a Heuglin’s Gull as well as tens of Dunlin, Kentish Plover and Little Stint feeding on the mud. In the reeds I saw at least four Reed Bunting and the same number of Reed Warbler. As the clouds got lower and darker many Common Swift, Barn Swallow and House Martin flew into the area together with at least ten Red-rumped Swallow. After the rain cleared I went to Kiti Dam which also had a good number of Swifts and Swallows as well as two Green Sandpiper. But again it was a warbler that was the best bird. There was an Eastern Bonelli’s Warbler calling from the trees and it took me some time to finally see it. One of my favourite birds! Categories: Birding | Tags: Cyprus Birding, Cyprus birds, Cyprus birdwatching, Greater Flamingo, Larnaca birdwatching, Larnaca Salt Lake, Larnaca Sewage Works | Permalink.